This image of the Pacific Ocean was produced using sea surface height measurements taken by the U.S.-French TOPEX/Poseidon satellite. The image shows sea surface height relative to normal ocean conditions on Dec.10, 1997 and sea surface height is an indicator of the heat content of the ocean. The volume and area of the warm water pool related to El NiÃ±o has increased again after reaching a temporary low around Dec. 1. TOPEX/Poseidon has been tracking the fluctuations of the El NiÃ±o warm pool since it began early this year. 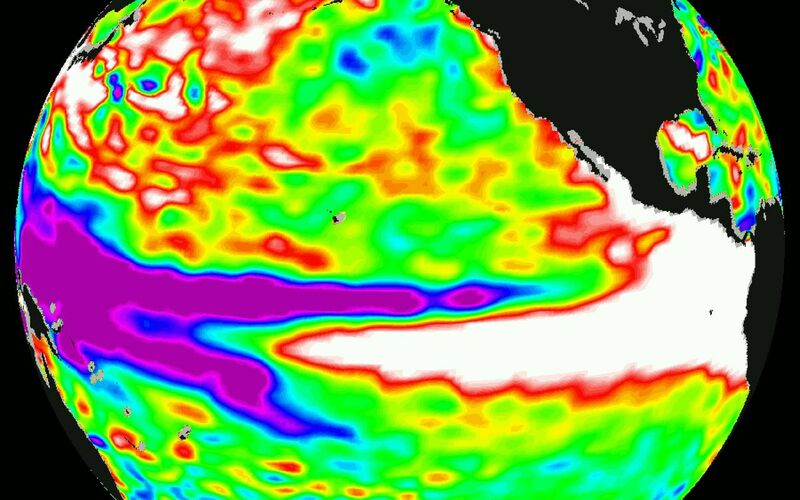 Oceanographers believe the recent increases and decreases in the size of the warm water pool at the equator are part of the natural rhythm of El NiÃ±o and that the warm pool is occasionally pumped up by wind bursts blowing from the western and central Pacific Ocean. Each wind burst has triggered a temporary increase in area and volume of the warm pool. 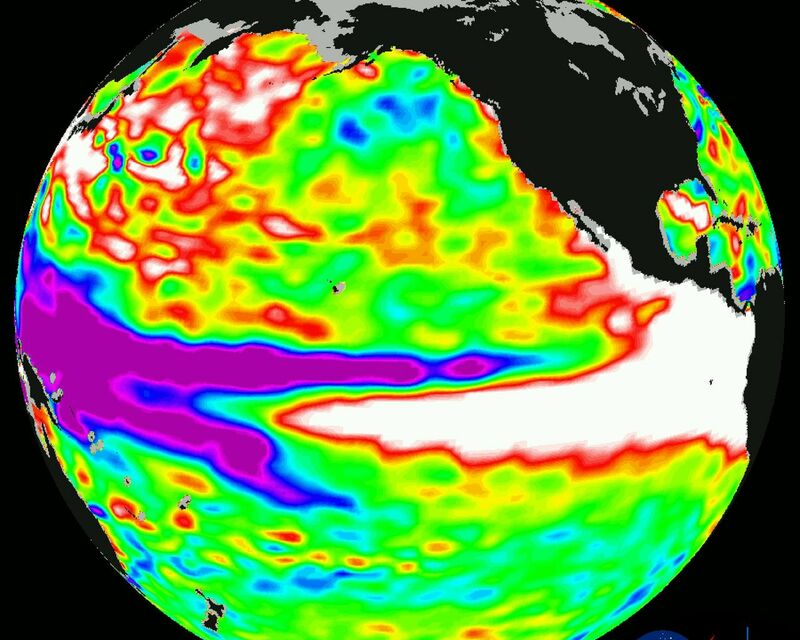 These data collected throughout 1997 have provided scientists with their first detailed view of how El NiÃ±o's warm pool behaves because the TOPEX/Poseidon satellite measures the changing sea surface height with unprecedented precision. In this image, the white and red areas indicate unusual patterns of heat storage; in the white areas, the sea surface is between 14 and 32 centimeters (6 to 13 inches) above normal; in the red areas, it's about 10 centimeters (4 inches) above normal. The green areas indicate normal conditions, while purple (the western Pacific) means at least 18 centimeters (7 inches) below normal sea level. 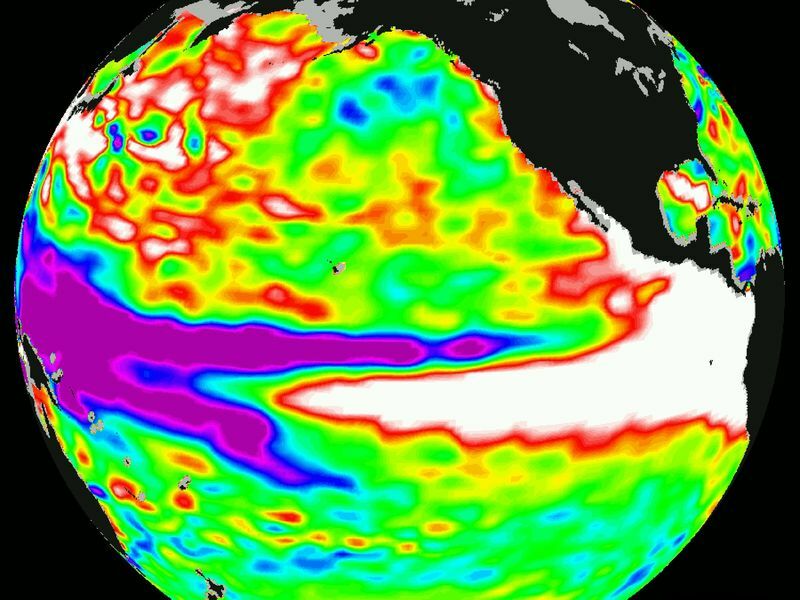 The El NiÃ±o phenomenon is thought to be triggered when the steady westward blowing trade winds weaken and even reverse direction. This change in the winds allows a large mass of warm water (the red and white area) that is normally located near Australia to move eastward along the equator until it reaches the coast of South America. The displacement of so much warm water affects evaporation, where rain clouds form and, consequently, alters the typical atmospheric jet stream patterns around the world. 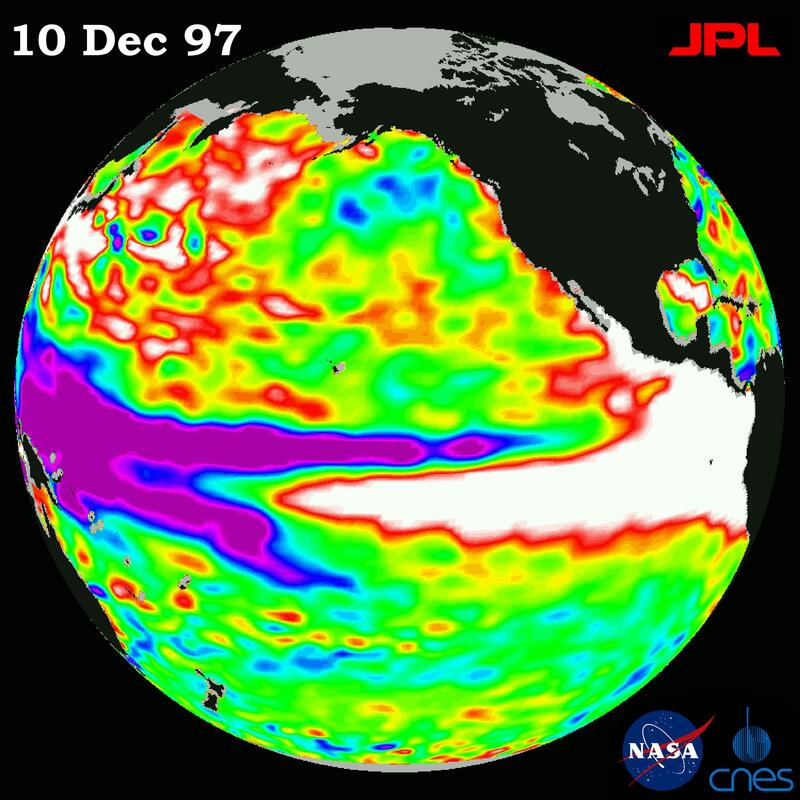 Using these global data, limited regional measurements from buoys and ships, and a forecasting model of the ocean-atmosphere system, the National Centers for Environmental Prediction (NCEP) of the National Oceanic and Atmospheric Administration, (NOAA), has issued an advisory indicating the presence of a strong El NiÃ±o condition throughout the winter.